We find this icon of the harrowing (or plundering) of hell on the festival row of the iconostasis. 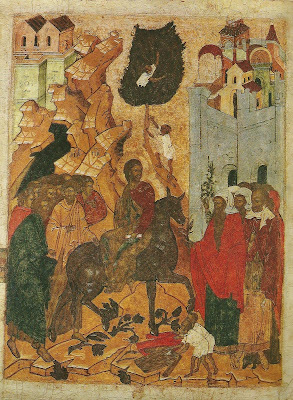 It is the icon that is used on Holy Saturday and traditionally is associated with 'the descent into hell' of Christ, in between his death and resurrection. That teaching is based on an understanding of 1 Peter 3:18-22, which goes back to at least 350AD (It was taught in the West by St Augustine). Later on we will look at 1 Peter 3 and suggest that those verses have a slightly different meaning, but it makes little difference to the sense of the icon. This icon is a celebration of the victory of Christ, and of what his resurrection achieves. These are the last words spoken by Jesus on the cross (Luke 23:46). They are the last words spoken by Jesus in his earthly life. If we put the different gospels together, then Jesus first speaks those words of utter abandonment, as he goes into the darkness, and takes the sin of the world onto his shoulders: 'My God, my God, why have you forsaken me'. Later John records how Jesus, just before he dies, says, 'It is finished'. Luke doesn't record those words, but he does say that after the three hours of darkness, the curtain in the temple is torn in two. Something has happened. The curtain which separated the Holy of Holies - that most astonishingly holy place where God said he would be - from the rest of the temple was ripped apart. God has come out. The death of Jesus on the cross has broken down all barriers. The way to heaven is now open. This is one of the more accessible icons. It also has profound depth. It tells the story of the day when Jesus rode into Jerusalem riding on a donkey. It is a significant story and it appears in all four gospels (Matthew 21:1-11; Mark 11:1-11; Luke 19:28-44; John 12:12-19). The particular icon that we see here is Russian and comes from the C16th. It can be found in the Pskov museum. Jesus is shown riding on a horse. Donkeys were unknown in this part of Russia, and so horses are used to depict the donkey. 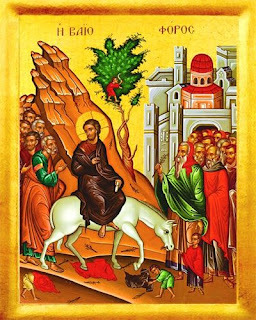 In this icon, the horse is noble – a far cry from the colt of the donkey that we are told Jesus rode on. Other similar icons have the horses submissively bowing their head. Many of us are driven by the pursuit for applause. We want our moment in the spot light. We want to be a star – in whatever is our chosen field. We want to know that we really matter, and that other people know we really matter. The astonishing thing about Jesus is that he could have had all that and more, and yet he never seeks the limelight. It is a real joy to share in your extended wedding celebrations. Thank you for the privilege of allowing me to speak. 1. The Rugby ball is made by having the panels stitched together. It is pretty useless if they come apart. State marriage is about a legal contract that you make with each other. But when you come to church to have your wedding blessed in the presence of God, something much bigger happens. You’ve been stitched up! You become bound together, not just by law, but by something that is bigger than law.